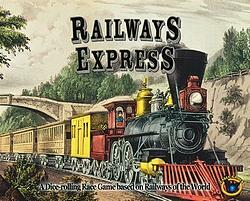 Railways Express is a new dice-rolling race game. Travel around the USA and parts of southern Canada and northern Mexico learning elements of the mechanics used in the popular Railways of the World board gaming system! Be the first to build track linking all 4 cities of your color to win! By linking cities with track, you are awarded re-roll cubes (and possibly cards), giving you strategic options for the routes you plan and the cities you link to reach your goal. This game is accessible to both younger players and yet totally enjoyable for seasoned veterans of the series.